At last an all-weather riding suit that is really all-weather? I first saw the REV’IT! Neptune GTX at Overland Expo 2015 WEST, as the REV’IT! team and I were huddled in the tent trying to keep warm during a flash snowfall in the middle of May. They were revealing a women’s version of a popular men’s suit bearing the same name. This suit takes women’s gear to a new level by matching the same tough fabrics and protective armor as the men’s line. While I watched the sleet and wind outside, the inclusion of Gore-Tex was also appealing. 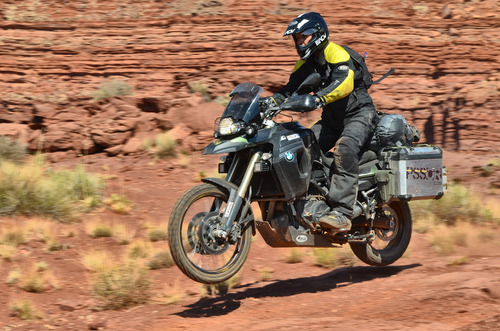 It was a few months later during another rare weather incident—this time a hurricane during Overland Expo EAST—that I took the suit home with me to try. If anything, the weather of 2015 taught me that no matter what’s predicted, you always have to prepare for the worst. The same holds true for riding gear. When traveling, you want something that will work for both ends of the weather spectrum. I was curious if the REV’IT! Neptune GTX jacket and pants would do just that. The suit boasts a lot of features as well as 4-season wear-ability. When you have the idea of riding the world you need it to be versatile. When you don’t have the luxury of a closet, one suit has to do it all for year-round wear. The Neptune GTX comes with three zip-in layers: a protective shell, a waterproof mid-layer, and a thermal liner. First, let’s look at the shell construction. Both materials are coated with Teflon (yes, think non-stick pans). Teflon is known for its slippery nature and when applied as a coating, the same characteristic that makes food not stick to metal pans, makes dirt not stick to the polyester or nylon fabric. Ideal combination for those off-pavement rides. Not to say that dirt won’t dry on it, but it will wash off easier, keeping the suit looking cleaner longer. With that said, the outer jacket and pants are not waterproof. Last weekend I rode part of the day in the rain, and without stopping to add the waterproof layer, I did get wet but not drenched. The Teflon coating helped the suit not soak up every drop of water and dry quickly when the sun came out. At least REV’IT! includes a waterproof pocket on the outside of the jacket (as noted with a label, but I really wish both were) so my important items stayed dry. Moving on to the mid-layer. It’s worth a mention that the Gore-Tex lettering on the outside of the jacket and pants does not refer to the jacket or pants. It refers to the rain liner that zips in underneath the shell. There has been a popular discussion lately amongst the rider community: is it better to have the waterproofing as a layer or baked into the outer shell? This is the first suit I have owned that is not waterproof on the outside. At first, I was uncertain about the idea that the Gore-tex included in the Neptune GTX was a liner and not part of the shell like with other suits. But that it has its benefits. Both Gore-Tex and Teflon are made of the same polymer: PTFE (polytetrafluoroethylene). It is an excellent insulator, hydrophobic, and weather-durable, which makes it useful as a component of Gore-tex. Gore-tex is a stretched, porous layer of PTFE composite used to laminate another layer of fabric, thus creating a waterproof barrier. At this point water (or sweat) can only pass through in one direction as vapor, creating a “breathable” layer underneath and water resistant surface on the outside. Although Gore-tex is a breathable membrane, it’s best suited for colder climates, as it needs a pressure imbalance (warm air inside the jacket vs. cooler air outside) for sweat vapors to be pushed outward. When riding in humid and close to body temperature environments, an equilibrium is created and, therefore, no place for sweat to escape to. While you may be ‘dry’ on the outside, the wet stays wet on the inside. This limits the number of seasons or weather conditions you can comfortably use the suit. When riding in hot and humid weather (think 90ºF /32ºC: summer in the south U.S., Central America, S.E. Asia, many parts in Africa) and not traveling 65mph / 100kph (i.e. in traffic or off-roading) to cool off the sweat, the difference between a Gore-Tex infused jacket and a non-Gore-Tex jacket is noticeable. With the Neptune GTX, the overall weight of the fabric is lighter, it breaths more and I can ride longer without overheating. Ultimately, this makes the day more enjoyable. Hence, having a Gore-Tex layer as a removable liner is a welcomed change. So why not ride with a thin, independent Gore-tex layer (like a simple rain jacket) on the outside? Maybe the benefit is best described in an example: what happens when you are riding in the rain, the tires slip on oil or a wet leaf, and you fall and slide for a few feet? Or you are riding off-road and a branch catches your upper arm? The Gore-Tex waterproof layer is not as durable as the polyester or Cordura outer shell and will tear the fabric, leaving the layer rendered useless against keeping water out. Having it as a mid-layer, preserves the protective quality of the Gore-tex. Although the outer shell is not waterproof, the Teflon coating helps the fabric repel dirt and not retain water, meaning it does get wet, but it dries quickly. And lastly, the zip-out thermal layer. On every jacket I have owned with a removable thermal layer, I remove the layer and leave it in my closet. Some people like the zip-ins, and to each his own. If I were using this suit year-round from a home base, I would zip them in when I knew what the weather was going to be like during the weekend ride. But for long-term, long-distance travel, especially when packing space is at a premium, I prefer my own clothes to layer underneath. So, forgive me if I skip over the plastic, quilt-like, polyester fill layer. The other two layers are what really make the jacket dependable. As my riding partner says, if you are wearing a wool base layer, a fleece, a down jacket, a waterproof jacket, and a riding jacket and you are still cold, then it’s time to stop or you are riding in the wrong season. Unfortunately, I am not in a location where I can test extreme cold or even cold weather. As noted above, you can always add more layers. Yet, taking off layers has its limits. The true test of an all-weather suit is how well it vents. The Neptune GTX has 5 vents on the jacket and two on the pants. The two vertical vents on the upper chest and the two on the upper thighs are only 6” long, but allow a good amount of airflow. The horizontal exit vent across the back does its job and keeps the form of the jacket together rather than having extra fabric flapping in the wind. The drawback is that the jacket vents become obstructed if you wear a backpack, which comes in handy during long days of riding in hot weather. A low belt pack or tucking it into the rabbit pouch is a way around that. On the arms, you can open the zippers from the wrist to the elbow, but I wish the mesh fabric covered the entire area. It leaves a little triangle exposed to the sun if I don’t pay attention. So far, riding in 30-35ºC (86º - 95ºF) weather is comfortable on the bike and off the bike, the lightness of the fabric helps to not overheat. The armor in the Neptune GTX is REV’IT!’s proprietary Seesoft armor, which is rated CE-Level 2 and the highest level of protection available. It’s temperature stable, meaning between 40ºC and -10ºC the quality of protection remains the same, and that covers any weather conditions you may be riding in. The open structure of Seesoft’s design allows for better ventilation during hotter days, while retaining impact protection and comfort while moving around on the bike. This is the first time it is included in a women’s suit and is the standard in most of the REV’IT! men’s line. Finally, let’s talk about fit. Between the men’s and women’s version, the style is the only difference. Same materials are used throughout, but women’s gear is designed by and made for women. REV’IT! has one of the largest lines of motorcycle suits for adventurous women. The fit of the Neptune GTX is a bit boxier than other suits in the REV’IT! line, but that is true for most adventure motorcycle gear these days. First pleasant surprise was how well they fit. With that said, am above average height for a woman and regular clothes are hard for me to fit. The pants (which I ordered in 40 long - normally I wear an 8/29 long in jeans) were finally long enough. I say finally, because, after 5 years of searching for pants that sat in the correct position when riding, this was a first. It’s not only the length of the pants (long version measures a 33” inseam) but is where the knee pad sits on the knee when riding. Other pants I have tried, even when ordering men’s long length, the knee pad awkwardly rests above the knee cap, and that doesn’t do much for protection. The REV’IT! Neptune sits below the knee when standing up, and right at the knee cap when riding. The jacket is a good fit, but I wish it came in a long version as well. I sized up (I ordered a 44 — normally I wear a 10/12 or large top) to gain length in the arms and the shoulders with all of the layers in were a little tight on the 42. Because I have a larger chest, the waist is much larger than I need and even cinched down it is bulky. Not a perfect fit but the adjustable rails at the waist help. The stretch fabric at the elbow and knees help with articulation and comfort. Does it pass the test of 4-season, all-weather versatility? Absolutely. If I were looking for one suit to own that is capable of wearing during any time of year, this would be at the top of my list. The ease of adding and subtracting layers makes it viable for any weather you might encounter.
. . . is to lose one of them, especially when they are your favorite. A few months ago, I lost the right hand of my favorite motorcycle gloves: the “Sambia” by HELD. They were a splurge buy after my motorcycle trip to South America. The flimsy pair of Fox gloves I had taken with me (a bargain at $20 a pair) had served me well during the trip, and I was impressed they had lasted the entire 6 months. I used to balk at gloves that cost more than $100, and before buying the Helds I had never owned a pair of motorcycle gloves that cost that much. The Held gloves came in at $120 USD, but they were worth every penny. I have long fingers and the Sambias comfortably accommodate that. They are made of Kangaroo leather on the palm, breathable nylon on the back—sewn together with the seams on the outside of the fingertips—with hard plastic, ventilated protection over the knuckles. I had never put on a glove that fit in all the right places and moved in the right direction until then. Hours on the bike did not deter its comfort factor. When I lost one of the gloves, I couldn’t help but be frustrated and sad. I live in Panama where there is no regular mail service to easily order another pair. So I had to find what was in stores here. Luckily mall culture is huge and there are a couple motorcycle apparel stores, although brand selection is limited. Returning to my self-imposed limit of not spending more than $100, I eventually found two pairs of motorcycle gloves: Rev’it! “Striker,” which retail for $80 USD, and then during a subsequent purchase, Klim’s “Adventure” gloves (non-current version) for $60 USD. Why did I buy two pairs when I only needed one? Because I made a rookie mistake when I bought the Rev’it! Strikers. At the store I appreciated the basic features of the gloves: the goatskin leather palm with breathable nylon on the back (this time seams on the inside) and a plastic knuckle protector that wasn’t as bulky as Helds. One feature I really liked was the additional contact fabric on the first finger and thumb, which makes using smartphones with gloves on that much easier. I had fitted them in an air-conditioned store and they felt great. When I took a weekend trip during humid 37ºC (98ºF) weather, I realized I bought a size too small. The circulation in my hands was cut off. I tried them a second time during another long ride to see if the humidity had helped the leather stretch at all . . . Nada. I went back to the store to buy a second pair in a bigger size, but as with many lessons learned in Panama, you buy it when you see it because if you go back to get it, chances are it won’t be there. And they weren’t. More Rev’it! gloves would not be in stock for another couple of months. So I bought a pair of Klim gloves at another store. The Klim gloves are all right and they work just fine, but I can feel the downgrade in materials. The padding is decent, but the leather on the palm is thin. They breathe well, which is nice in the heat, but my biggest gripe is that the cuff is too short. I don’t want to worry about getting sun burned on my wrist when I ride. To compare Klim to Rev’it you can notice the differences, but to compare Klim to Held is not fair. For twice the price you definitely get twice the glove. The biggest lesson I learned is to be more careful with my favorite gloves because, as far as I know, a “lost and found” for single motorcycle gloves does not exist. After spending some time riding with these three pairs of gloves, which would I buy again? The Rev’it Strikers (of course in a correct size). For the price you get a lot of glove, and the smart-phone friendly fingertips sealed the deal. Finally, I will impart this piece of advice, which I wish I had known before buying: What to look for in sizing a shorter style, warm-weather adventure glove? · With the glove on, stretch your fingers out as wide as possible and see if it pulls uncomfortably on any points of your hand. Look at the seams… can you see thread pulling away from the fabric? If so, it may be too tight. Check the palm for excess fabric. If you can pull more than a fingernail’s worth of fabric, it’s too loose and you need a size smaller. How do your fingertips feel? Is the space maxed out or do you have wiggle room? While you don’t want to have a lot space between you and the fabric, it should be snug enough to accommodate the natural expansion and contraction of your hands during different weather. · Clench your fingers into a tight ball and feel if the protection on the top of the hand or on the fingers digs in anywhere. Open and close your hand several times to see if there is any rubbing on your hands. This can cause sore spots or calluses. Try to minimize this. · The grip test (the emulate the grip on the handlebar): hold up your first two fingers like you are making a peace sign. With the opposite hand make a “c” shape. Place your peace finger hands on the leather of the “c” hand between the thumb and forefinger and push down at the curve. This is how your hands will feel for hours while riding. How do your fingertips feel now? If there is too much pressure in the fingertips or too much wiggle room try a different size or another style / brand. 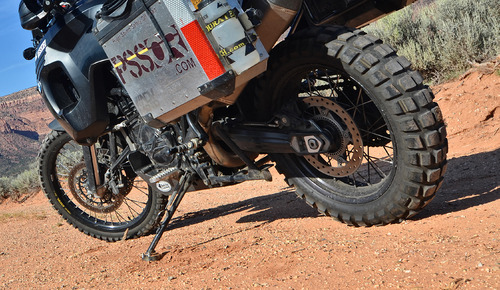 Klim Adventure (current version) and Held Sambia.